We’re not there yet, but I see it coming: the day when the totality of life shines before us, simply and purely, as just the mother of all apps. And once we come to understand life as a miraculous platform, then eyesight would be its genius-sensor, a drifting, all-seeing viewport. Artists could find some solace: painting would be a kind of old-time magic, an intuitive, parallel account of life that provided mental diversion and respite. There are fragments of truth in this: life and eyesight are indeed miracles, and painting magic. But what’s magical about painting is not that it puts a creative gloss on reality; it is a reality, providing in some ways our closest experience of the visual world. We never confuse a painting for the object it represents; instead, we absorb from the painting, perhaps unconsciously, anentire array of sensations: heft of object, scale of gesture and cruciality of location. The good artist invariably suffuses an image with such inflections. As museum-goers will attest, this is what separates a master like Chardin from a lesser painter like Oudry, or Picasso from Max Weber. After all, painting, at its best, is not therapeutic, but profoundly nourishing. Like great music or literature, it allows a momentary and intimate connection with someone possessing a transcendent understanding of the world. While an academic artist, writer or musician applies flourishes to skillful and diverting craft, a great one characterizes through the elemental energies of the medium. Today's painter has no choice; to paint truly is to inflect – to find and impart character, using only the poor means of pigments spread about a rectangle. As the adage goes, an artist’s challenge is to paint “not what you know, but what you see” – another way of saying that the route to revelation lies in keen looking. Kotula’s fifteen small still lifes reveal a great deal of sharp observation, and also a deft synthesizing of impressions. They show the power of color – of not just tone, hue, and intensity, but also that inexplicable quality of density or pressure – to re-enact the workings of light. In “Blue Pitcher with Squash and Eggplant,” for instance, an eggplant, viewed end-on, becomes an almost perfect sphere, with slight shifts of purple – several degrees of full and reflected light—giving an unlikely vastness to its circumference. One imagines an ant traversing time zones in trying to circumnavigate it. Intervals take on a curious urgency; at either side, the forms of a zucchini and a pitcher glide weightily across the canvas, distanced from the eggplant by angling and arcing folds of bright fabric. Behind all these objects, and pinned in place by the striped wall, the table’s gray-beige surface stretches away like a sheet of water withdrawing on a beach. Other notable paintings by Kotula include “Lemons and Limes with My Mother’s Dish Towel,” with its nugget-like citrus fruits, rimmed on top by light and condensed upon a sea of white fabric. In “Onion Shadow,” a spoon rises jauntily from a metal pitcher, becoming the outermost reach of an angular dance between the pitcher (all silvery diagonals) and a large sea shell (a fantastical assemblage of off-whites). If Kotula’s still lifes are notable for their measured movements, Tony Serio’s landscapes revel in leaps of space. His fifteen paintings, all depicting street and park scenes around Riverside Park, celebrate the transformative power of sunlight, capturing vistas in interlocking zones of shadow and illumination. In “Autumn, Stormy Sky,” a tower of the George Washington Bridge, tiny in the distance but sturdy in its squared-up stance, responds to a passing cloud, turning from palest yellow to delicate purplish grays. Meanwhile, practically under our noses, and filling almost half the canvas, a frothy sea of trees responds to the same sunlight in contrasting blazes of yellow, green, and deep ochres. Contradictions abound –dark foreground note against light background, and then the reverse – but so felicitous is Serio’s re-creation of a particular time and weather that we immediately comprehend each plunge. A central event, such as a vertical tree trunk or human figure, anchors many of Serio’s paintings. In the nearly five-foot-wide canvas “Spring, Distant Rain,” a tree’s numerous bare limbs angle through the center of the canvas, practically saturating its space. In “Summer,” another large canvas, the vantage point of a central figure, kneeling with his back turned, becomes our own. 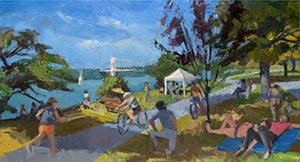 A riot of moments – the bridge, a tent, joggers, sunbathers and bicyclists – radiate around the figure, paced by the particular weight of sunlight on each event; I found myself drawn again and again to a single trunk, where a “simple” sequence of charcoal-purples, bluish grays, and the grayest greens viscerally caught its passage from sunlight to shade. Neither Kotula nor Serio pursues a particularly splashy or quirky style or subject matter. Instead, in different ways, both relate their visual experiences within an elemental language of forms and colors. The paradox of painting, as well as its greatest reward, is that such images become all the more real through its abstracted language. How to give pictorial gravity to thinner-then-air light? It’s the eternal challenge of the painter.